The dwarf planet Ceres takes nearly five years to complete an orbit. This is why Cererian Birthdays are taken very seriously amongst those who like to celebrate such things. Lying in the asteroid belt belt between Mars and Jupiter, Ceres is classed as a dwarf planet rather than an asteroid as it comprises around a third of the mass of the entire asteroid belt and is large enough to have become rounded by its own gravity. 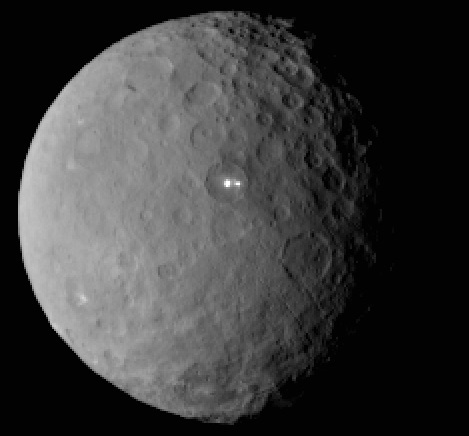 It was visited in 2015 by the Dawn robotic spacecraft which identified two distinct bright spots (higher resolutions show them to be several spots) on its surface, suggesting the presence of water ice.